Offer exclusive to Newfoundland resident AIR MILES® Collectors who register their Metrobus m-Card online and register to earn AIR MILES® reward miles between May 2, 2012 - April 30, 2017. Earn 1 AIR MILES® reward mile for every 2 on-board electronic validations during the offer period, excluding transfers, to a maximum of 10 on-board electronic validations per Collector Account per day. Please allow up to 60 days for reward miles to be posted to your Collector account. ® ™ Trademarks of AIR MILES International Trading B.V. Used under license by LoyaltyOne, Co. and St. John's Transportation Commission. The serial number on your m-Card must not be altered in any way. Do not deface or alter the appearance of your m-Card. When you are not using your m-Card, it can be transferred to another person who would ride the bus in the same fare category (eg. Adult to Adult, Child to Child, Senior to Senior), however, each person boarding a bus must have there own way to pay the fare. Monthly and Semester Passes can only be used by one person per trip. 10-Ride passes can be swiped once for each person boarding using the same m-Card. Transferring an m-Card to a person in another fare category is strictly prohibited. Always carry your pass with you. Do not leave it in your locker or unattended. Treat your bus pass as you would cash, because there are no free replacements for lost or stolen passes. Monthly passes are sold by the calendar month, not 30 days from the date of purchase. 30-day passes are effective from the date the card is reloaded, not from the date of first use. Defacing or altering the appearance of the pass. All fare media products are non-refundable. There are no refunds or replacements for unregistered m-Cards under any circumstances. Registered m-Card holders can have a lost or stolen pass replaced for a $5.00 replacement fee. Once the replacement fee has been paid, we will then load the replacement card with the balance that was remaining on the original card at the time the card was reported lost or stolen. Replacements can only be done at our office at 25 Messenger Drive. By registering your m-Card and providing your email address, you are agreeing that we can send you service information, customer news, AIR MILES® reward miles offers, and other topics of correspondence which may be of interest to you. You will have the opportunity to opt out or unsubscribe from these messages at any time by clicking the unsubscribe link contained within the message or by managing your preferences from within your m-Card account. Metrobus is a Sponsor of the AIR MILES® Reward Program. You may receive email communication because you have opted-in to receiving email offers and information from the AIR MILES Reward Program and its Sponsors. For more information on Metrobus fare and pass options, visit our fares & passes page. Metrobus is pleased to offer its customers wheelchair accessible service through the use of accessible low floor (ALF) buses on Metrobus routes 1, 2, 3, 5, 14 and 23. The ramp can be used at over 80% of bus stops with more than 40% of stops deemed to be fully accessible for customers using mobility devices. Please refer to the Bus Stop Signs Category section of our Accessible Transit Handbook for more details. Metrobus is introducing wheelchair accessible service on a phased in basis to increase access for customers using mobility devices. For more information about our accessible service, continue reading below, or view the current version of our Accessible Transit Handbook - this booklet outlines the various fixed-route accessible service categories and definitions, and a list of bus stops that are currently inaccessible for customers using mobility devices. 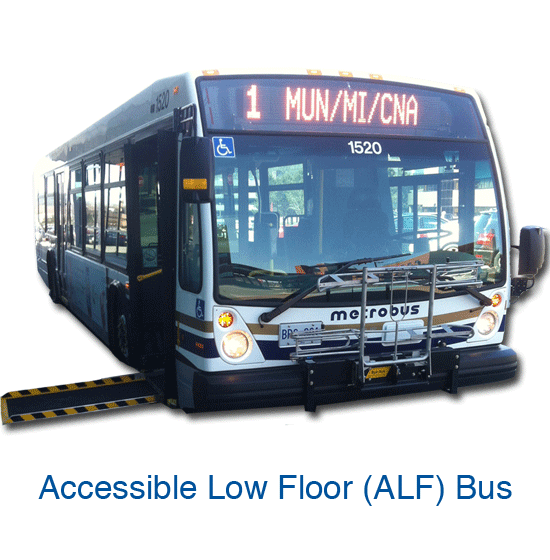 What is an Accessible Low Floor (ALF) bus? Features the international accessibility symbol on all four (4) sides of the bus. © Copyright 2012 - 2019 St. John's Transportation Commission. All Rights Reserved.